"Wolfing down food" is instinctive to wolves because if they don't eat their prey fast, another animal will. Unfortunately for many domestic dogs, they've inherited that instinct from wolves and wild dogs, but because of the domestic dog's more delicate digestive system, wolfing it down (or "woofing it down") might end up as dog bulimia. 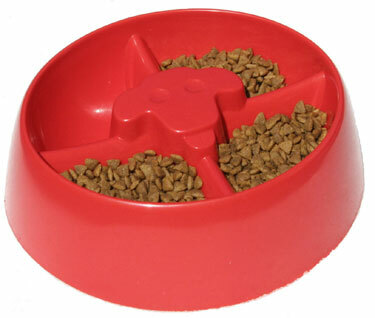 DogPause® is a new dog bowl designed to slow down a dog's eating behavior. It has four quadrants instead of one large one, and the quadrants are just big enough for the dog's snout so his food intake is limited both by the size of the quadrant and the fact that he can't open his mouth too wide while his snout is in there. With DogPause, your dog will have to work for his food. If your dog does wolf down her food, without chewing it carefully, make sure you are feeding her outside of the presence of other pets, kids, or even grown-ups, whom the dog considers to threaten her meal. Just assume they are threats, even if you have no proof of it! If the DogPause does not slow his eating behavior down enough to avoid choking or vomiting after eating, begin your dog's training by going into a small room with your dog and his dinner. Sit down on the floor with him, while he sits, and feed him in spoonfuls, slowly, and by hand. Pause between each spoonful and praise him when he chews the food. Talk to him in between spoonfuls, as if you were both enjoying a leisurely meal together. The slower he chews it, the more you want to praise him. (Scolding is not recommended; your dog will not understand why he is being scolded and, anyway, praise works far better than punishment in almost all behavior modification.) Then, slowly graduate to the DogPause bowl, continuing your praise when your dog eats slowly. DogPause is not your most stylish dog bowl. The bowl is plastic and it doesn't grip to the floor with any kind of rubber hold. The inventor says there's a purpose for allowing the bowl to slide around; it makes the dog work harder to get the food out of the bowl. That is a good point and, as you can see below, the total design of the DogPause works to the desired result: getting Buddy to eat more slowly! As for being the answer to bulimia or other eating disorders in dogs, the DogPause may certainly be one answer. Along with changing your dog's bowl, positive behavior modification should be used to reinforce thorough chewing of food. A dense, tasty canned food might help change your dog's eating behavior as well. Find out more about DogPause here!